Barbas is the servant of Clavicus Vile, the Daedric Prince of wishes, and can be found in Willowgrove Cavern. When Vile granted the wish of Pircalmo, a mage visiting Willowgrove, Barbas became bound to Vile's altar in the Cavern. 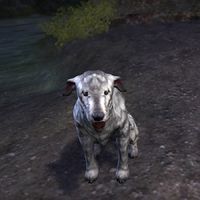 Barbas can also be encountered on Vvardenfell, assisting Clavicus Vile with his plot to discover the location of Sotha Sil's Clockwork City, as well as on Summerset. "Hah, you mortals. You always make me laugh. Yup, I'm a talking dog. Name's Barbas." "His wife will get eaten if you sit around talking to dogs all day." I've turned this contrivance into a portal machine! Here, let me give you a taste of divine power! Patience, Master. The portal is almost ready! Can't you feel it? The way to Oblivion is becoming wide! It's working, Master! Vivec's energy was the key! During the events of A Necessary Alliance and The Crystal Tower, Barbas somehow still has Sunna'rah on his back. ? This page was last modified on 3 August 2018, at 19:41.